It is only normal that many people today rely on their iPhone as an alarm clock to wake them up in the morning or to serve as a reminder for an important activity. However, with the sound very similar to the default iPhone ringtone, it is also normal that the ringtone becomes boring over time as it could be confusing especially when you are half asleep. Many of us will prefer to wake up to something really more personal – a tone that spreads more positivity and prepares us for the day. Part 1: How to Change Alarm Sound on iPhone iOS 12/11/10? Part 2: How to Customize Alarm Ringtone of Your Own for Applying on iPhone Alarm Sound? Step 1Launch the clock app and select "Alarm" tab. Step 2Click on the "Edit" tab at the top left corner, and click on the alarm of your choice. Step 3You will find "Sound" among the options. Click on it and select the new tone you wish to set as alarm. You can select any text tone and ringtone of your choice. Step 4Tap the "Back" tab and click on "Save" so your preferred alarm tone will be selected as your new sound effect. Changing the alarm tone offers a variety of good options you could select as your iPhone alarm clock ringtone. However, it may feel even more ideal to customize a ringtone – one that you could easily relate with – one that will wake you up just the way you desire. Although the traditional way to make alarm ringtone on your iPhone iOS 12/11/10 is through iTunes, version 12.7 and later of iTunes does not display the Tones tab anymore. Hence, it is now ideal to make use of a third party program to customize your alarm ringtone on your iPhone iOS 12/11/10. A valuable third party program for this purpose is iMyFone TunesMate. In customizing an alarm ringtone for your iPhone, iMyFone TunesMate helps you achieve the following tasks. You can customize your alarm ringtones from wherever it is stored on your iPhone/computer. You can select your preferred part of the tone and preview it before saving it on your device. You can easily edit and delete the alarm ringtones without using iTunes. You can transfer ringtones from iTunes to iPhone, or vise versa. You can get rid of iTunes limitations and errors when transferring data or making ringtone. iMyFone TunesMate offers you a lot of flexibility to allow you customize alarm ringtone on your iPhones device. Here is how to make the most of the third party program to create custom ringtones for your alarm sound. Step 1Launch iMyFone TunesMate on your PC and connect your iPhone to the computer. Step 2You would find "Music" on the top interface of the program. Click on it and select "Ringtones" from the left side bar. Once you have selected "Ringtones", you will find a list at the top of your screen. Click on "Ringtone Maker". A window which provides you with the tools you need to customize the ringtone will be displayed. Step 3Since you have already stored the song in either the "Local Music" or "Device Music" folder, click on either of them to access the saved music. Step 4Make use of the editing tools found on your computer screen to adjust the tone appropriately (maximum length of 40 seconds) so you can use of it as your alarm ringtone. Step 5Once you are done editing the song, click "Save to Device" below your screen. You will be able to set the song as your alarm ringtone once it is transferred to your iPhone. Alarm ringtones are very invaluable. For those who need to get up as early as possible every morning, alarm ringtones are important in getting them up to a great start. Hence, it would only be reasonable to set an alarm tone that you can easily relate with. The alarm tone is also great for a reminder. 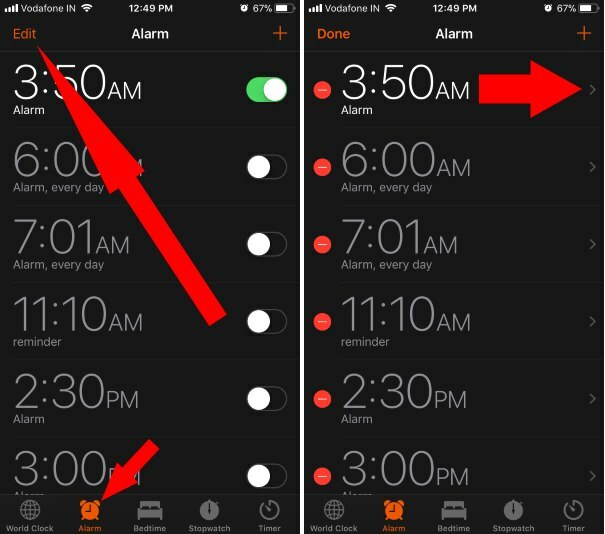 It can be really frustrating to hear your alarm ringtone from the iPhone of someone else, while a unique tone increases the awareness you have and feels a lot more personal. Follow the easy guide above to make your own alarm sound ringtone on your iPhone iOS 12/11/10.